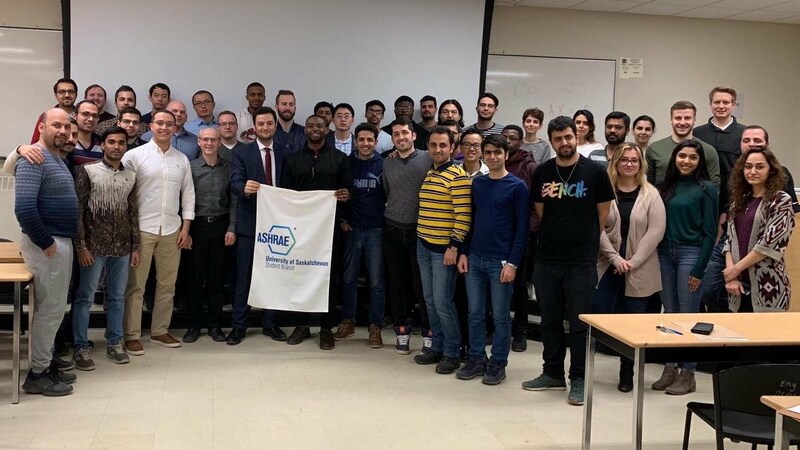 After +50 years of leading HVAC research taking place at the University of Saskatchewan and having active ASHRAE Chapter in Saskatoon, the University of Saskatchewan (USASK) Engineering students established an ASHRAE Student Branch. The inauguration meeting was on March 27, 2019. It was a pleasure to see many undergraduate students, graduate students, professors, industry leaders and ASHRAE leaders. Look forward to seeing the amazing student leaders making their USASK Student Branch of ASHRAE a great success. First off, I would like to thank the ASHRAE Saskatoon Chapter for allowing me the opportunity to take part in this year’s Annual Winter Conference in Chicago, Illinois. It was a fantastic experience and I am grateful to have been able to partake in it. The programming for the entire conference was great, from the opening keynote address by Aron Ralston, to the AHR Expo at the McCormick Center. I also enjoyed the programming they organized for the students attending the conference. They provided multiple opportunities to network with others as well as a list of sessions that would be best suited for our skill set. I attended as many seminars as possible but only found a few that were at my level of understanding based on my educational background and experience. My favorite seminar was about indoor air quality. The speaker addressed how to prevent IAQ issues during the design process and how to identify problems that exist in previously existing buildings. I also had the chance to partake in two technical tours. First, was the Ann & Robert H. Lurie Children’s Hospital. We were told that it was one of the world’s greenest children’s hospitals so I appreciated being able to tour around and see the inner workings of the systems and mechanical rooms. The other tour I went on was of Walgreen’s Net-Zero store. This store is on track to produce more energy than it consumes by using efficient lighting, solar panels, and wind turbines out in the parking lot. The thing I found to be most valuable from these tours was how important communication is during the design stages. Most notably the communication involved with the architects; they and engineers need to come together in order to make buildings that are actually feasible. I think my favorite thing was attending AHR Expo. I enjoyed walking around to the different exhibitors and talking with different presenters. I was able to network with several different companies. I was amazed with the mere number of presenters and how many companies are involved in the HVAC industry. Overall, this was a wonderful experience. I learned a lot and met a lot of great people. I would advise anyone else interested in HVAC to attend in this conference in the future. Thomas Ingold & Shamim Ahamed were recipients of this year's ASHRAE Saskatoon Student Travel Scholarship to the ASHRAE Winter Conference in New York City. Here are their reports on their experiences. I would like to start this report on my experience at the 2014 ASHRAE Winter Conference in New York City with a sincere thank you to the members of the Saskatoon ASHRAE Chapter. I would not have been able to attend this conference were it not for the generous scholarship given by the local chapter. It was an experience that will be remembered throughout my life. During my time at the conference I was able to learn about and see a plethora of new technologies, design methods, and existing applications. In the essence of brevity for this newsletter report, I have highlighted some of the most interesting things that I learned or experienced. One of the highlights of the conference was technical tours. While in New York, I was able to tour the Hearst building, a Platinum LEED building, and 55 Water Street, a skyscraper in the financial district. One of the innovative elements of the Hearst building was the water feature in the buildings main atrium. This water feature is run in part by rain water that is captured from the roof. In addition to having visual appeal, this water feature serves to cool and humidify the atrium. Heating and the majority of the cooling was achieved through the use of radiant panels. This design choice minimized the amount of visible venting, giving the atrium a clean and polished appearance. During the tour at 55 Water Street, a 3.5 million sq. ft. building with a capacity of 14,000 people, I was able to see the building's cooling plant and their thermal storage facility. The thermal storage method utilized was ice. Ice storage was used for cooling purposes and is only economical due to the fact that the cost of electricity varies by time of day in the United States. As such, the building operators purchase additional electricity during the night, while it is cheaper, to freeze the water in the ice storage tanks. Then during the day, when electricity is more expensive and temperatures are higher, the ice is melted for cooling purposes and to level out the peaks in the cooling demand to minimize the building's electrical demand. It is an interesting solution to minimizing electrical costs; however, such a system would not be economical in Saskatchewan due to the cost of electricity being a set rate. The majority of my time at the conference was spent attending a variety of seminars, technical paper sessions, and forums on numerous topics. One interesting concept was personalized ventilation. This was attempted in a number of different ways, but the most effective method utilized a wearable head set ventilator with a nozzle and an air supply tube delivering filtered air to the individuals' breathing zone. It should be noted that the personalized ventilators are sensitive to occupant movement and positioning of the ventilator. Some other interesting things that I learned include that the RTS (radiant time series) method is not very accurate for calculating cooling loads for radiant systems. Radiant systems typically have higher peak loads that conventional systems; however, this does not mean that it has a higher energy consumption. The operative temperature should be used instead of dry bulb temperature when designing with radiant panel or chilled beam systems. Double-skin facades can be used to increase building performance. Frit can be used to reduce glare issues and the shape, colour, and size of the frit impacts its effectiveness. Hydrophilic coatings on a heat exchanger plate will cause condensation on the fin to spread out in a very thin layer, whereas hydrophobic coatings will make the water bead up and minimize the contact of water with the surface. It was found that super hydrophilic coatings resulted in the greatest reduction in condensation reduction, even more so than super hydrophobic coatings. The above examples are but a few of the concepts that I learn about while attending the technical program. The AHR Expo featured an immense number of vendors and products. One of the products that I found most interesting was brazed plate heat exchangers. Prior to visiting the expo the majority of my hands on experience with industrial heat exchangers was with large plate and frame, shell and tube, and wheel heat exchangers. The brazed plate heat exchangers are extremely small and according to the vendor they are more efficient than gasketed plate and frame heat exchangers. I am a little sceptical about this claim but have not yet had the time to research it in more detail. In closing, I would like to reiterate my gratitude for being given the opportunity to participate in such a large and worthwhile event. I learned a great deal and the experience amplified my interest in the HVAC field. If anyone would like to hear about my experience in greater detail, feel free to contact me at thomas.ingold@outlook.com or talk to me at one of the monthly local ASHRAE meetings. I am very much pleased after attaining the ASHRAE winter conference in New York. It was a great opportunity for me to get a new experience to join in an international conference and attain in some presentation related to HVAC research area. It was my first international conference where most of the events were really excellent to me, especially to meet with some expert and new engineer from different part of the world. As graduate student, I am personally working with HVAC system of greenhouse. As result, I have learned some valuable outcomes of the recent research related to HVAC system and also to share my experience with two researchers who are also working with greenhouse HVAC system. I was excited to visit the exhibition and it was really great opportunity to get experienced about the large numbers of company and their products for HVAC system. I believe this kind of opportunity funded by ASHRAE Saskatoon Chapter is really a great opportunity for the graduate and undergraduate student of University of Saskatchewan. I would like to thanks to all of the people of ASHRAE Saskatoon chapter who are giving their effort to support the student to attain the conference organized by ASHRAE. Welcome to a new ASHRAE year! K-12 education will again be a focus of the Student Activities Committee this year. I am personally working on a electricity generating bicycle lab use for Grade 9 science. If you are interested in helping me with this or if you have other ideas for K-12 participation this year, please let me know. ASHRAE Saskatoon will be giving out scholarships to UofS and SIAST students again this year but we are changing to a new exciting format. This year, the scholarships will be used to send students to the winter meeting and AHR Expo in New York! I'm looking forward to hearing about their experiences. The feedback from the students who attended the YEA-student bowling night a couple weeks ago was fantastic and I hope we can continue to engage students this year. We have run into a snag with the SIAST scholarships and are no longer able to give scholarships in the same manner as before. The BOG is working on this issue, but I would welcome any ideas on how we could spend the money effectively and help students. The HVAC/R lecture and tour of the Parktown hotel that we did for the U of S ME491 students was a big success and it looks like we will be invited to do it again next year. Happy New Year! Work continues this year on reviewing and updating our scholarships at both SIAST and the U of S, hopefully we will be able to reward students who are interested in the HVAC/R industry. We have a HVAC/R lecture and tour planned for the ME491 class at the U of S again this year and we will again be inviting any 4th year design project teams with industry related projects to present at a monthly meeting this winter. The November meeting will be a Student night; say 'hi' to any students who show up for the tour. Have a good month! Remember to bring any HVAC/R books that you don’t want to a meeting or contact me and I’ll pick them up. These books are being donated to ASHRAE Student members and Student Chapters in developing economies. As always students are welcome at any monthly meeting for a reduced meal cost of $5. The fourth year Mechanical Engineering design teams have been very busy for the last couple of months putting the finishing touches on their designs. We are lucky enough to have one of the groups with an HVAC related project doing their design presentation at our meeting this month. I’m looking forward to the presentation. Thanks a lot!! ASHRAE really encourages that all of us participate in K-12 STEM (Science, Technology, Engineering and Math) activities. Judging science fairs, giving presentations and helping teachers with science resources are just a few of the ways we can make a difference. This year I have done one high school level presentation on the role refrigeration has played in mining and have a couple of junior high presentations on hydraulics and pneumatics scheduled for the end of March. If you have an opportunity to participate, I strongly encourage you to do so (and please let me know). It is a fun way to give back. Remember to bring any HVAC/R textbooks that you want to donate to ASHRAE student chapters in developing economies to a monthly meeting so I can get them where they need to go. As always, students are welcome at any monthly meeting for $5.00!